New Beginnings is an Early Childhood Development is an academy for training of practitioners that has been in existence for 23 years. Patsy Pillay, their Director, was proud to launch their very first anthology of stories for practitioners to read to small children. 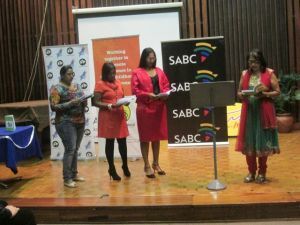 This took place on Saturday 13th at the SABC Hall 1 in Durban. In her talk, Patsy told the audience there are 20 000 creches or pre-primaries in South Africa, most of whom have no books with stories for small children. “Our Stories for Young Children” which is the title of their anthology, has been beautifully illustrated in colour by Gill Nicholson. The stories follow a theme of Social Justice, and through the stories, small children can learn about other cultures, about kindness, helpfulness, gender equality and understand positive values. Patsy brought on stage a team of three student teachers to bring to life three of the stories. Patsy’s favourite is called “Our Hero, Tata Mandela” which helps children to understand, in simple language, how our democracy was formed. Patsy would like to find sponsorship for a big run of the books so that she can GIVE every crèche a copy of this book.